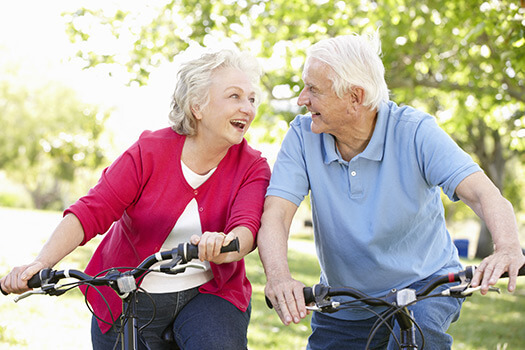 Cycling is a fun filled way for seniors to get some fresh air and exercise. Seniors who want to remain healthy as they age can benefit in a variety of ways when they receive professional non-medical home care. Oshkosh, Wisconsin, Home Care Assistance is here to help your loved one accomplish daily tasks, prevent illness, and focus on living a healthier and more fulfilling life. Some seniors may not have been on a bike since their childhood, and they will be surprised to see the various bike options available in the market. Many aging adults opt for comfort bikes with padded seats and low gears, which are built for smooth riding. Thanks to these lifestyle bikes, seniors don’t have to fear uncomfortable and painful bike rides. Here are some of the reasons why retired seniors should start cycling. Biking is a low impact exercise, which means the body never makes hard contact with the ground. Low-impact exercises are often ideal for seniors, as stiff joints and soreness can make high-impact exercises painful. Riding a bike can be a good activity for seniors who have consistent knee pain and arthritis, as it puts little impact on their joints. Cycling can also provide the benefits of cardiovascular exercise while minimizing the risks of injury in older adults. Biking is an economical way to travel and requires little maintenance, which can be a great benefit to seniors who are on a fixed income. Once seniors start riding comfortably, they can visit friends and run errands on their bike. Consistent bike riding can reduce the risk of serious conditions such as heart disease and type 2 diabetes. Studies have shown people who ride their bikes for 20 miles a week reduce their risk of heart disease by 50 percent. Cycling is a great source of cardiovascular exercise, which keeps weight and blood pressure under control, strengthens the lungs, and protects the circulatory system. For family caregivers, helping a loved one get into an exercise routine can be overwhelming. If your senior loved one needs hourly or live-in care, Oshkosh Home Care Assistance can help. Our caregivers can assist with exercise and mobility, prepare nutritious meals, provide timely medication reminders, and help with a wide array of other important daily tasks. Cycling isn’t just good for the body, it’s also good for the soul. Seniors who want to boost their emotional health should try cycling, as it can help relax an overworked brain. Riding a bike involves repetitive motions, which can have meditative effects on the mind. Seniors who need to reduce stress should take a trip to a local bike trail and concentrate on the rhythm of their pedaling to feel relaxed and regain their peace of mind. Stress is also common among family caregivers, as they often try to do everything themselves. If you are the primary caregiver for a senior loved one in Oshkosh, respite care is available when you need time away from your important caregiving duties. At Home Care Assistance, our respite caregivers are available 24 hours a day, 7 days a week to help your loved one manage everyday tasks in the comfort of home while you have the chance to take a much-needed break. Call (920) 710-2273 today to learn more about our senior care services and how we can customize them to meet your loved one’s needs.